The Futon Shop, a multiplier manufacturer, has been making green mattresses in San Francisco since 1976. Buy green buy American! A new line of American made certified organic crib mattresses will be introduced this Labor Day. This Labor Day, celebrate by buying American made products. This Labor Day, celebrate by buying American made products. Statistics found by writer from the ABC show, Made in America, that if American’s buy 1% more of American made products, this will increase 200,000 jobs in the USA. Companies that manufacture products such as mattresses like The Futon Shop is a prime example of a multiplier Factory. By purchasing products made in a Multiplier factory, the products are made by multiple employees, and consumers are helping multiply the American workforce with products made in America instead of products made in other countries. The Futon Shop is one of the longest standing companies that personally hand make each and every mattress in America. The Futon Shop has been producing futon mattresses in San Francisco since 1976. The Futon Shop uses organic and green material in all mattresses, ensuring customer’s bring environmentally safe products into one's homes. This year The Futon Shop has launched a new line of healthy mattresses for babies, the Lullaby collection. All mattresses are standard size, 28”Wx52Lx6”H. All mattresses are firm, and the factory is solely for organic and green manufacturing. 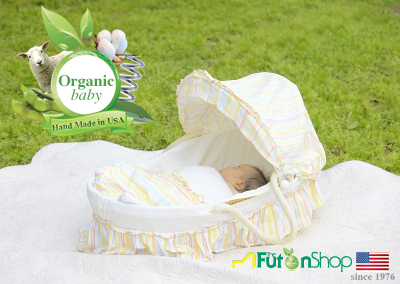 The Futon Shop organic cotton is brought in from America and Organic certified. The Futon Shop’s Mission is to create a better and healthy night’s sleep, by providing premium green material and the best comfort in all mattresses. The cotton used in all crib mattresses are pesticide free and certified organic. The Organic Trade Association states that cotton covers 2.5% of the world’s cultivated land, yet uses 16% of the world’s insecticides, more than any other single major crop so when possible buy organic cotton for your family and the planets health. The toxic free fire safety organization found through studies at Duke University, that it is imperative that babies sleep on chemical free products because they are more susceptible to harsh environmental dangers. The 2010 and 2011 analysis showed baby products donated from volunteers that 80% of products tested contained hazardous or untested chemical flame retardants. A 2008 article written in the a CNN news reports, quoted, Dr Alan Greene, a professor of pediatrics at Stanford University in Palo Alto, that "although it can be expensive, if a parent spends his money on one “green” item, he said it would be an organic crib mattress." A new mother can protect an innocent child in the womb, but when it comes to the harsh reality of the dangers once they are born, parent’s can protect newborns by buying a healthy mattress void of toxic chemicals that emit poor indoor air pollution. Buying organic cotton products for newborns, guarantees a safer and a healthy planet for future generations and the earth. What makes a safe green crib mattress? In the CNN report, Dr Green is also quoted by stating that conventional crib mattresses are often made of polyurethane foam, which is basically solid petroleum, putting-off gasoline fumes that become extremely flammable. Most companies that develop mattresses with polyurethane and traditional crib mattress load up their mattresses with a multitude of deadly flame retardants that sit in the foam and emit the chemical into the air. What are the dangers to avoid with crib mattresses? Babycenter.com and Consumer Reports are major websites that are recommended by most doctors and are great resources for new mothers and fathers. One of the biggest issues with choosing a mattress is the fear of the raising risk of SIDS. The main issue when choosing a healthy crib mattress is the firmness. Consumer reports and Babycenter.com both suggest to get the firmest crib mattress. This problem occurs when a baby sleeps on a soft mattress, it can create suffocation. The Futon Shop crib mattresses are all hand made to feel firm and supportive. Babycenter.com recommends buying an organic mattress no matter the price because it will “give parents peace of mind.” It is the chemicals and industrial compounds used in standard mattresses- such as flame retardants known as PBDE’s, vinyl, and polyurethane foam that are harmful. Babycenter.com also recommends not buying used crib mattresses, because this has been known to cause SIDS. http://www.Crib-mattress-reviews.net reports found dangers found in crib mattresses are BPA, Phthalates, PFOA, and PBDE. The Futon Shop avoids toxic exposures because of their organic benefit. BPA aka bisphenola is used for the lining of the crib mattress, which is voided when manufacturing organic cotton mattresses. Phthalates, is another unsafe toxin, which helps waterproof crib mattresses as does PFOA perflourooctanoic aka c8. Again The Futon Shop uses only organic cotton textile for a waterproof crib mattress pad, which eliminates the latter two chemicals. And PBDE's will never be found in any of The Futon Shop products because they do not use dangerous fire retardards. So whether you are buying mattresses for adults or children; buy green, buy organic, buy American.